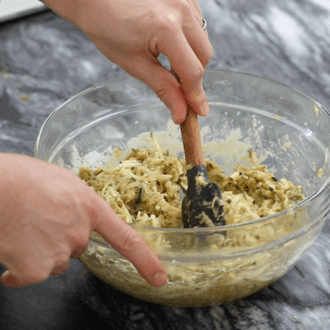 Easy to make one bowl zucchini muffins featuring toasted walnuts unsweetened coconut and a hint of maple syrup. 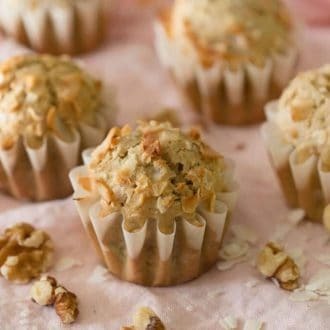 My favorite part of these muffins is the shaved coconut, which toasts during baking; so aromatic and I love the crispy texture! The sweetness level was spot on for me, definitely not cloying but eating them certainly does not feel like penance either! For a vegan option nix the eggs, whisk in 7 1/2 teaspoons of ground flax seeds into nine tablespoons of water until it becomes gelatinous. You can sub out the coconut flour for regular all purpose flour if you don’t have any/are not a fan. Toasted pecans would work well in this if walnuts are not for you. You could also skip the nuts altogether! Coconut flakes don’t have to be featured in this dish, you might prefer raisins (I only like raisins if they’re soaked in rum), or dried cranberries. 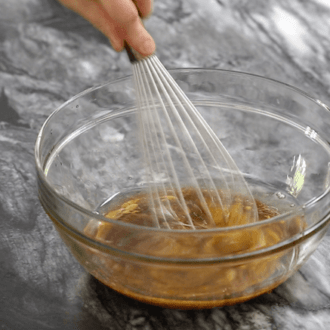 Some people aren’t big on maple syrup, you can go for honey, agave or just add in an extra 1/3 cup of brown sugar. 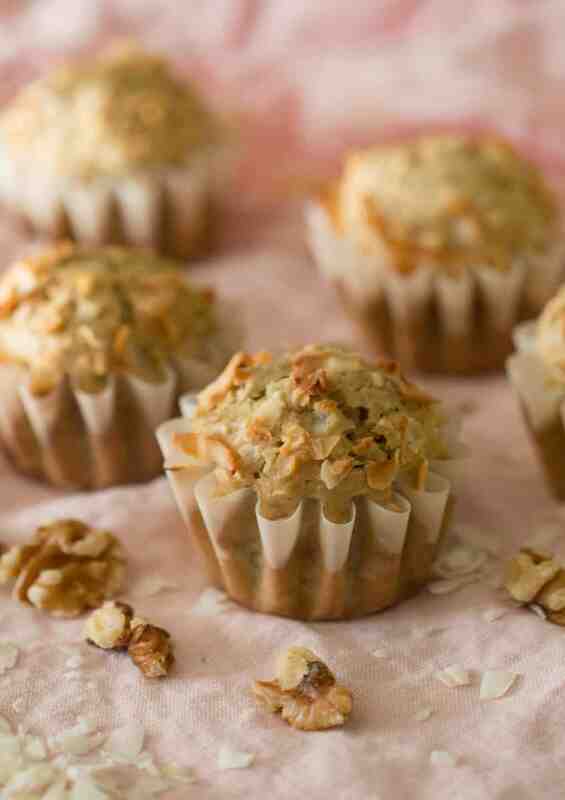 Delicious one bowl muffins filled with walnuts and coconut flakes with a touch of maple syrup. Beat eggs, oil, sugar and maple syrup in a bowl. Blend together coconut flour, baking soda and salt. Add zucchini and nuts. Pour batter into papers. Add zucchini and nuts. Pour batter into papers. Sprinkle shaved coconut on top of each muffin. Yumm!! Love the zucchini ! These were so yummy! Loved the maple syrup and zucchini combo!